The project aims at creating a new sustainable modular system by transforming a former factory building with dim, dark, wet and moldy environment into a nature platform by adapting four essential environmental elements - sun, air, water and earth. The paper factory is supported by a solid rigid frame in reinforced concrete to bear heavy loading of the paper production. Because of its high structural performance of the plant, modular components can be easily added to the existing structure without considering additional structure reinforcement. Once the new natural components are integrated into the existing structure, each module is transformed into a passive energy system and provides natural day lighting, ventilation, cooling and heating. The natural component in each module system also makes nature visible within a building and connects space to each natural elements - natural spot light, fresh air, water feature and green space. 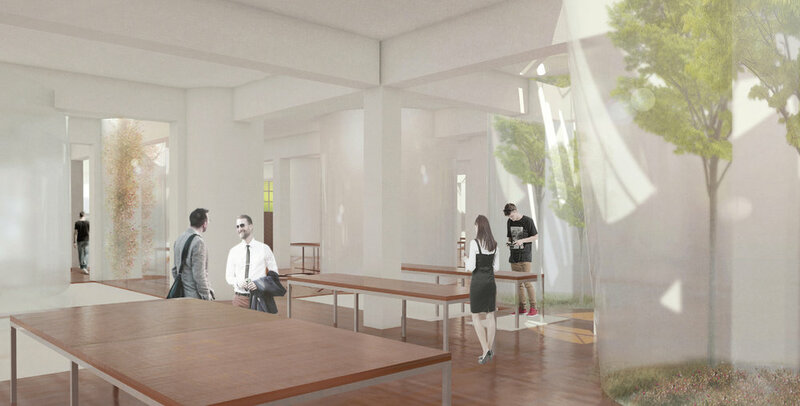 The module can be inserted into an existing building in accordance to the use of the space. It is a flexible building system that can be easily adapted to many different functions.